Daisuke Okabe and I have been doing research on portable technologies for many years now, and we've enjoyed seeing how things have evolved. For as long as we've been studying mobile phones there has been much talk about location based services and the imminent convergence with the handheld computing space. There have been tantalizing glimpses at possiblliities with current talk about the geospatial web, google map mashups, geocaching, etc. etc. But Daisuke and I haven't yet had anything meaty to sink our ethnographer's teeth into as far as practices that are hugely popular among the young people we talk to in Tokyo. So we started to wonder if there were any examples of location based media technologies that were viral among youth, and had natural ties to the digital domain. This situation led us to a study of Print Club (purikura) picture stickers, which have been a well-established feature of Japanese youth culture since the late nineties. Almost all high school girls we have spoken to say they will take purikura every time they are out on the town with a friend or a group of friends. 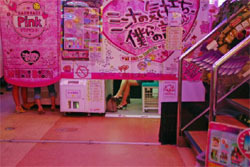 Purikura rely on a location-based infrastructure of photo booths that are generally located at game centers and tourist spots. Although initially purikura were simple, low res photos printed onto a sticker sheet, now they have entered the digital age. The photo booths are like mini studios, with variable lighting, green screen, seating for large groups, bars to hang off of, and other variations. The booths also feature photo modding technologies accessed through a fun touch-screen interface. And most recently, booth manufacturers have enabled people to email their purikura from the booths to their mobile phones and PCs. Despite this push toward digital trafficking of purikura, they remain firmly grounded in paper-based media. Almost all high school girls will carry their puri-cho (purikura albums/scrapbooks) around with them as a materialization of their social network. This summer I did a field study with Daisuke, Jan Chipchase from Nokia, and Aico Shimizu who works with us at Keio. Jan and Aico trained Daisuke and I on techniques for doing spot interviews of people exiting purikura booths, which was a new kind of method for us. We also did our usual diary and depth interviews to round out the picture. And we had a bit of fun taking some purikura ourselves. The work is still in progress, but we've just finished a short position paper for the Pervasive Image Capture and Sharing workshop for Ubicomp 2006. Check it out if you are curious to know more about this image sharing practice. This was a very enjoyable article. When in Tokyo, I really enjoy to just drop by the purikura halls. It’s fascinating. Most fascinating. In an endless variations of ways. 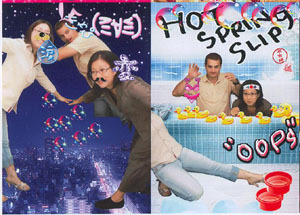 In one way the purikura phenomena shows us all the difference between Japan and the rest of the world. The photo both was well known to all of us in the west for many many years. And nothing much happened there for equal amount of years in terms of product development and improvement and innovation. Then the revolution came.. and typically enough from Japan. And why is this so typical? Well because of the huge amount of legal craziness and odd thinking, that goes hand in hand with Japanese creativity, style and innovation. And they think this is great and good for future business!? Its not. It’s killing the audience interest. And more typical is that the people in charge are not from the industry core, the development department or share a good enough first hand experience of the business they actually are managing. In Japan, most of the people you meet on a high up level, are people with great knowledge. They often made a few games themselves, won awards, did draw films or comics for many years as assistants, created toys and worked overtime trying to create the “perfect monster” in clay and wire, to be able to talk the boss into a new project, and then they climbed all the way up to their positions. And they know and they recognize talent, strength, heart and healthy craziness. And they are aware that the audience, the buyer and the people of the earth are smart enough to understand products and media with a twist. And that people appreciate healthy weirdness’. This is why Disney lost my attention long ago. There is so little heart in Disney now a days, and in my eyes, a total lack of oddness’. This is why Mario today has surpassed Mickey Mouse as “most well known character”, and this is why the board of directors and executives in the west should change jobs and let a new and fresh generation take their places or just take a seat in the school of life for a while. That is why the Japanese youth culture is invading the west. That is why the words Manga and Anime are so common today! They where unknown to the big audience just 10 years ago. I know that cause I formed one of my media / IP company and did my first really big lecturing tour all over the globe. Few understood what I was talking about at that time. Today it is different. Lets just walk down to the “how to draw” section in your bookstore, art store, comics store or your cool media store. Just check out how many “how to draw comics the western way” there is. I did the test just 2 days ago, in my home town of Stockholm, at our cool Science Fiction book store( Science Fiction bokhandeln) ,that sells all things cool known to mankind. There where 4 books with a classical Marvel / DC approach ( western style ) and the rest was “How to draw Manga”, “How to draw Manga robots”, “How to draw Manga for beginners”, “How to draw Manga girls”, “How to draw Manga villains” etc etc! This goes for the rest of Europe and US as well. This is part of the legacy of our future. So..back to the purikura. To me the purikura phenomenon has all of this. The development from the common western grey and dark, often dirty and warn out photo both, to a color sparkling touch screen, “edit yourself”, social networking, “have fun with your friends in a friendly atmosphere” purikura photo booths, summaries the whole Japanese approach on how to take things further. How to develop with a open mind and how to look at new ways of using old technology and given user behavior. And just one more thought that pops up in my mind as I read about purikura . In the west technology driven companies so often forgets the girls, the women.. half of our planet. When the mobile phones came along, the approach from our local phone hero’s, Ericsson ( now a days making great phones under the name Sony Ericsson) was to create a grey, boring and very very manly and technical, even nerdy phone. Phones for men? photo booths for men ? Well according to all numbers I ever read, girls tend to talk longer and more often than ever a man does. So why develop a business man telephone before even looking into the possibility of creating a cute and fun phone for girls? That is why purikura is a great example of how to use what many thought to be a “mans technology” to make something very fun and girly! Long live the healthy weirdness’. Hi, my name is Andy and I am currently trying to open a Purikura shop in LA. I am in the process of writing my business plan to obetain funds from banks. As an Asian (Chinese American) and having been to Tokyo I know how big Purikura is, and how integrated it is into the Asain culture. However, I need actual numbers and hard evidence such as the interviews that were mentioned in the above article. I am wondering if the authors of this article can contact me to send me the research that they have on this topic so I can incorporate it inot my business plan. Any help will be greatly apreciated. Thank you. My e-mail is andyis0302@yahoo.com. Thanks.